Twenty-six people were safely removed from a looping roller coaster ride at Six Flags Discovery Kingdom in Vallejo after it became stuck mid-ride Wednesday, a park spokeswoman said. The Boomerang Coast to Coaster stopped mid-ride at 1:54 p.m., Six Flags Discovery Kingdom spokeswoman Nancy Chan said. Riders were safely escorted from the ride by staff within an hour. No injuries were reported, Chan said. She didn't have any details about why the ride stopped. The riders were facing forward and upright when the ride stopped, Chan said. It was taken out of operation later in the afternoon. 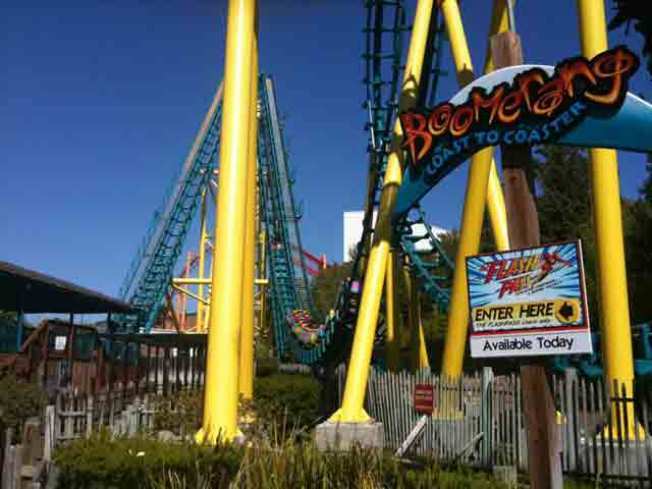 The Boomerang ride is located in the "Sky" area of the amusement and animal park. It features a "cobra roll" with two steep inversions and a "nerve shattering vertical loop," according to Six Flags Discovery Kingdom's website. It is described as a steel-track supercoaster that is 12 stories high and reaches speeds of 48 mph, according to the website. The 1 minute, 48 second ride goes forward through its track and then follows the same patch backward. The ride is 935-feet long.